New Year , New Dawn , New Hope. Baccus vs Baccus ... This will be interesting! Think we'll win this one. 2-1. Place your bets. Only if we can stop Lachlan Wales. Similar to Buhagiar with speed. Good to see Suman keep his place after his performance last week. Has Bridge been re-injured? Now Out for 5 weeks longer. Wasn't it less than that before? He's been injured for so long now that if it was known before we could have signed an injury replacement. By the time Bridge is ready to play again - and that will be more than 5 weeks - the season will almost be over. With his injury history this season and last, I doubt he has another season in him. I'd prefer him to play again and retire on his own terms with a sendoff, but maybe it's time to for him to retire and be replaced in January. Bridge spent the last few rounds of last season injured, got right again for the start of pre-season, got hurt a week into the pre-season and hasn't been fit since. That injury was a really bad tear of the smaller of the muscle in the bottom of the calf area. He spent 2 months doing rehab on it, then two weeks after starting training again, he'd come back too soon and stuffed it again. He'll be out until February at least, and he won't have any match fitness until the last handful of rounds of the season. Maybe Yeboah is the injury rep l cement for him. That took a bit of translating! Err...no need to apologise, Paul...just tell us what you meant? Injury replacement for bridge but not likely. So more likely that Fitzgerald is going. The shorter return time previously stated for Bridgey was incorrect. He was scheduled to return end of Jan/beginning of Feb, and continues to be on target. #NoGrozosNoParty hasn't been listed in the squad, nor the injured list. If Babbel does a Popa with teamsheet, maybe. Happy New Year all.........and it's Game day.! We have to get a result or we may as well write this season off..........Chance of thunderstorms again in the west......hopefully not as bad as the game against the smurfs and the kickoff is on time. 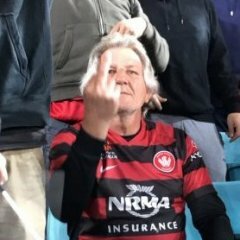 On a positive note we go home to Parra this year.....the nightmare that is SOP. is coming to an end........! They're Heartless when away from AAMI, so I'd expect us to dominate this game. Disrupted train service from Lidcombe to SOP because of yesterdays storms. Allow plenty of time. Going to use the car then. Ta. Which we've done before. The trick is to score goals and win the damn match. Can’t wait to see the outrage at Yeboah not playing.